We caught up with Clinic Seeker CEO Lisa Jacobs to get the latest on what her company has been up to. Tell us a bit about Clinic Seeker. Clinic Seeker is a free mobile healthcare app that can be downloaded from the Apple or Google Play store. Clinic Seeker will quickly identify the closest and most appropriate Walk-In Clinic, Urgent Care, Nurse Practitioner-Led Clinic, Emergency Department and Mental Health Walk-In Clinic. All healthcare information for each facility is provided which includes address, hours, phone and fax numbers, website, directions and currently crowd-sourced wait times. The unique benefit to the user is the ability to quickly determine which clinics provide on-site lab and x-ray services, along with their phone number and hours of operation. A slide out tab with one click dialing for Telehealth, poison control, the crisis center hotline, and a number for Ontario residents looking to find a family doctor or nurse practitioner is also provided. Anything new and exciting happening within your company? The last few months we have been working with Splice Digital, a leading digital innovation company in Windsor, to create a portal for healthcare facilities to be able to update their hours daily, enter an estimated wait time, and input information they would like to share daily. This feature will be available within the next couple of weeks. We will be keeping the crowd-sourced wait time feature, but recognize healthcare facilities should also have the ability to enter their current wait time. 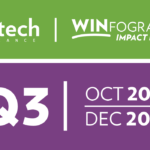 How has WEtech Alliance supported your business to date? Being named one of the top six start-ups in Windsor-Essex through the WEtech Libro StartUp program has helped Clinic Seeker achieve milestones. The WEtech team has stood behind Clinic Seeker from the beginning. Working with Adam, learning how to engage partners in innovation strategy and consumer engagement has been extremely valuable while working together with community partners. Knowing how to “pitch” to different stakeholders in the healthcare system from patients to community partners has been instrumental in moving forward. Looking into your company’s future, what are you most enthusiastic about? If I could have coffee with an industry expert it would be William Charnetski, the Chief Health Innovation Strategist for Ontario. He is an accomplished national and global executive who has worked transformational change, developing organizations, leading people to realize their full potential, fostering internal and external partnerships and collaboration, and delivering results. Truly inspirational.